Do you like Super Mario? Do you like board games? Then, you will love the Mario Party series. Mario Party is a Virtual Boardgame, one of their most popular games to date. You can play as one of your favorite characters such as Mario, Luigi, Yoshi, Princess Peach, and more. You can choose from different boards to play on, such as Donkey Kong's Jungle Adventure, and Peach's Birthday Cake. As you go around the board, you collect stars that will crown you the superstar and win the game. The plot of the game is to decide who out of Mario, Luigi, Peach, Yoshi, Donkey Kong, and Wario is best to be crowned. In the second installment of the game Mario Party 2, the main plot is to defeat Bowser in order to regain Mario Land. The game includes new characters and new boards, as well as new minigames and items to collect. A year later in 2001, Mario Party 3 was released. This was the last installment of the game for the Nintendo 64. In this game, characters fight in new boardgames and collect star stamps to prove themselves worthy of possessing the Millennium Star, a bright star that's born every 1000 years. Legend says it makes you superstar of the universe. Previous characters returned along with two new characters: Princess Daisy and Waluigi. The Mario Party series has been considered some of the best games for Nintendo platforms. 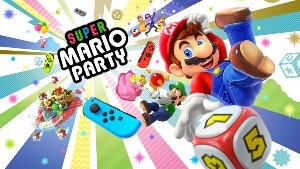 The latest mario party game will be released for the Switch on October 5, 2018. It will be called "Super Mario Party."